Despite the examples to the contrary, large-scale developments don’t have to be concrete jungles. 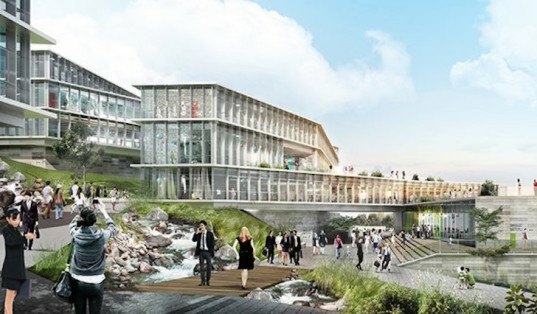 China-based PWD Architecture’s designs for the Dali Creative Area, a mixed-used development in China’s Dali City, will soon be living proof. 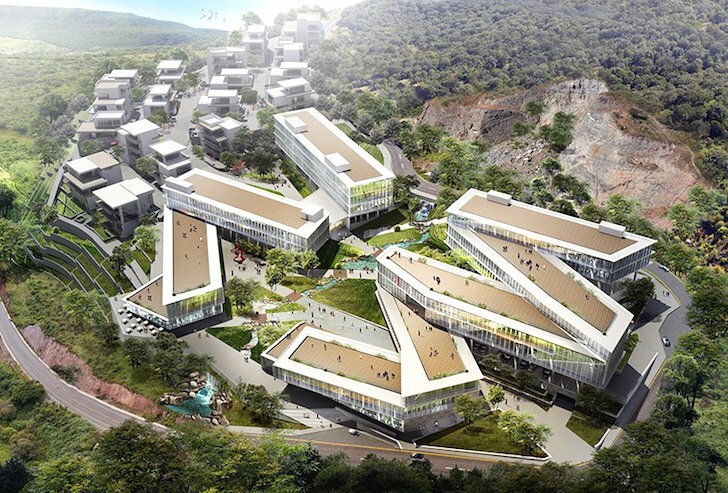 Slated for completion in 2016, the competition-winning project was created in harmony with the landscape, weaving green-roofed buildings and modern architecture into the lush Yunnan surroundings. PWD Architecture sought to create a complex that would celebrate the site’s natural beauty. Thus, the architects designed largely in section to optimize natural daylight and ventilation conditions, as well as to maximize landscape views. The modern glazed buildings will be built with a stacked bar construction system and feature clean aluminum and timber facades so as not to detract from the surrounding scenery. To minimize site disturbance, the buildings step down to match the natural topography. The main buildings are arranged into two zigzag formations flanking a central green space. The ground-level public spaces are complemented by a series of open-air green-roofed terraces. The Dali Creative Area will include exhibition areas, media room, multi-use offices, retail, restaurants, conference center, hotel, and a wellness spa. The ground-level public spaces are complemented by a series of open-air green-roofed terraces. The architects designed largely in section to optimize natural daylight and ventilation conditions, as well as to maximize landscape views. The modern glazed buildings will be built with a stacked bar construction system and feature clean aluminum and timber facades so as not to detract from the surrounding scenery. To minimize site disturbance, the buildings step down to match the natural topography. Diagrams of the design process behind the Dali Creative Area. The main buildings are arranged into two zigzag formations flanking a central green space.